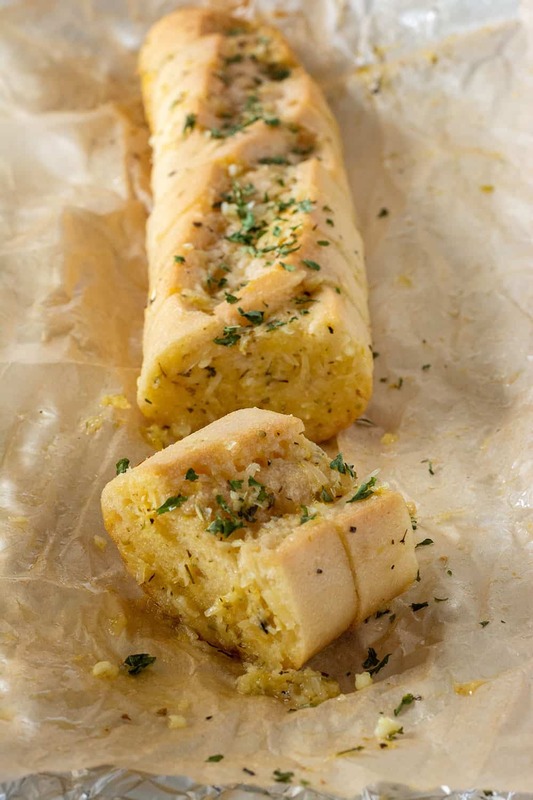 Enjoy this vegan garlic bread made with vegan herb butter and baked to perfection using gluten-free baguettes. Such a great treat! 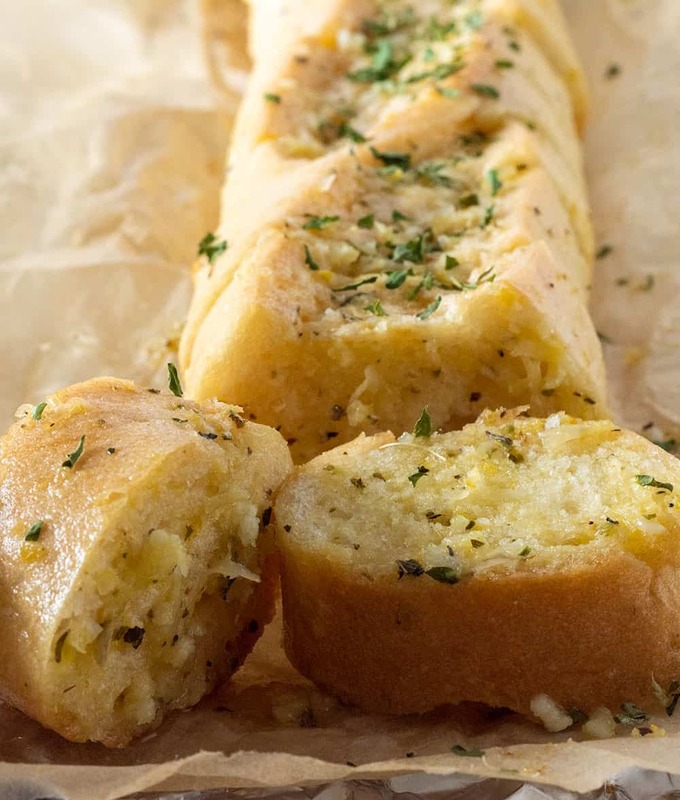 Absolutely the best garlic bread recipe that actually tastes better than traditional garlic bread. 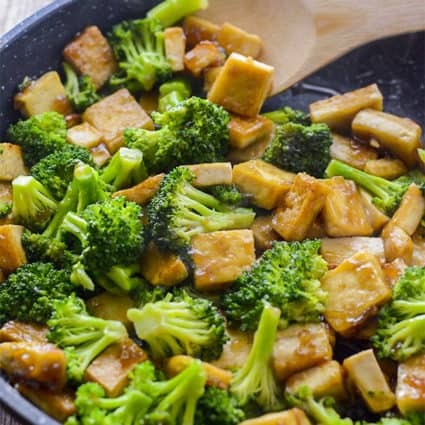 Serve it as an appetizer, side dish or snack. I haven't enjoyed baguettes in years since eating gluten-free, so I decided to purchase these Schar's gluten-free vegan baguettes from Amazon. I couldn't wait to try them and I must say they didn't disappoint. 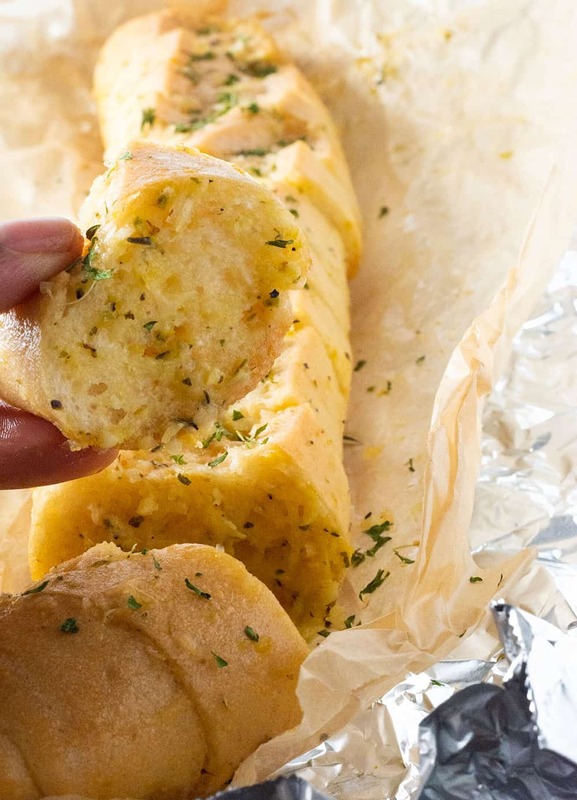 I used them to make these super soft and buttery homemade garlic bread. You honestly couldn't tell that they weren't regular bread. My son Daevyd enjoyed the warm, garlicky, cheesy, and melt in your mouth bread. I can't wait to serve them with my Lentil Meatballs. To make the garlic bread, I whipped up a batch of my Garlic butter which is easy to make. Preheat oven 400 degrees F. Cut the baguette in thick slices leaving a small fraction of the base to hold the bread together. Spread the slices on both sides with the garlic butter, then rub garlic butter all over the top and sides of the baguette. 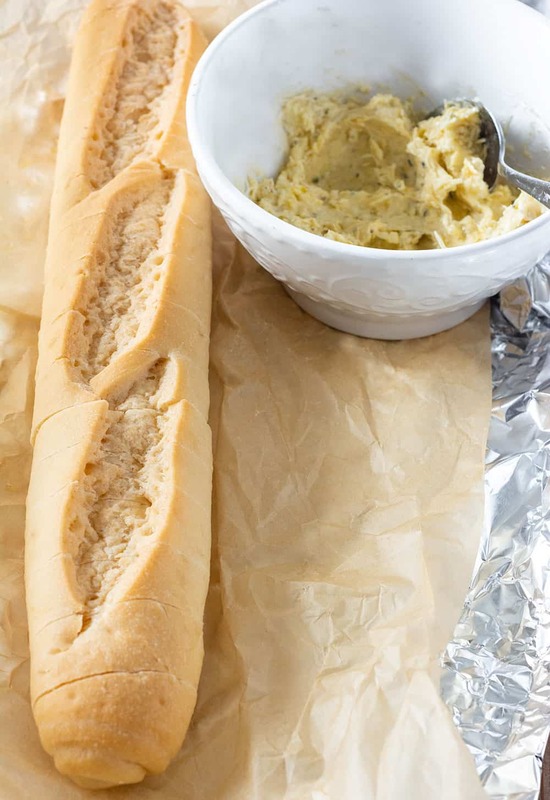 Wrap baguette with parchment paper then foil. Bake for 15 minutes. Remove from the oven an garnish with parsley flakes and serve while soft. I adapted the method from RecipeTinEats. 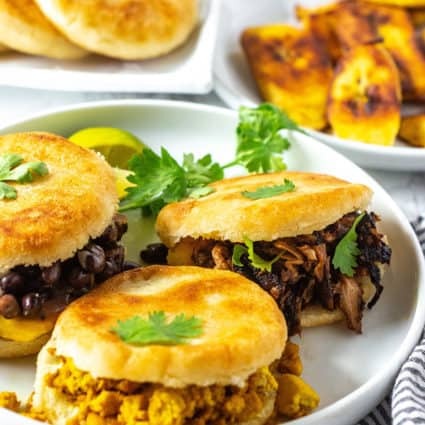 Make sure you wrap the bread with parchment paper and or foil to ensure the gluten-free bread results in a soft most bread otherwise it will be dry. 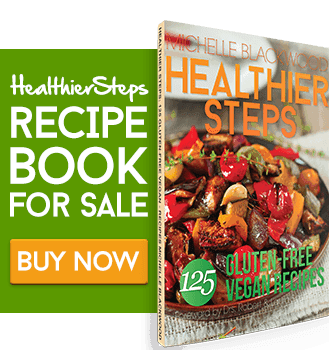 If you make this vegan garlic bread recipe, snap a photo and hashtag #healthiersteps — we love to see your recipes on Instagram, Facebook & Twitter! Preheat oven 400 degrees F. Cut baguette into thick slices, spread garlic butter on the slices and all over the top and sides of baguette. cover with parchment paper then foil paper securely. Cover with parchment paper then foil paper securely. Bake for 15 minutes. Place pieces on a platter and sprinkle with parsley flakes. I haven’t had garlic bread since going gluten-free. 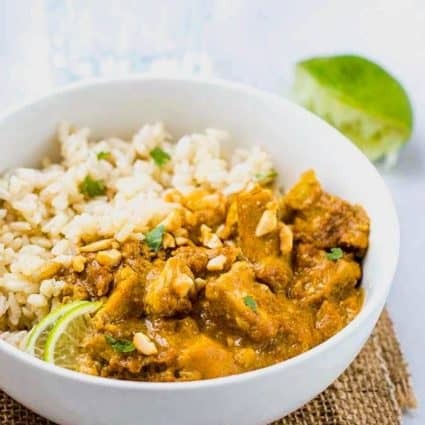 This recipe is a must try, so delicious!